Your Next Stamp Challenge #16~Cut It Out and Pop It Up! Hello! It's time for another Your Next Stamp Challenge, and this time Maureen challenged us to cut it out and pop it up! I love this challenge because it's something I do all the time :) Isn't this giraffe from the Your Next Stamp Giraffe stamp set so super CUTE!!! I'm not sure why I tend to associate giraffes with baby cards, but I do:) The dp is from the retired Basic Grey Oh Baby line, and the sentiment is from the SU set Short & Sweet. I will leave the complete recipe below. Winner – one lucky winner, chosen by random.org, will win $10 in YNS Stamp Bucks (to spend on YNS stamps) and the Winner Blinkie to proudly display on their blog! Top Pick – one lucky entry, chosen by Maureen, will win $5 in YNS Stamp Bucks (to spend on YNS stamps) and the Top Pick Blinkie to proudly display on their blog! You must use a YNS stamp on your creation to be eligible to win the Top Pick prize. 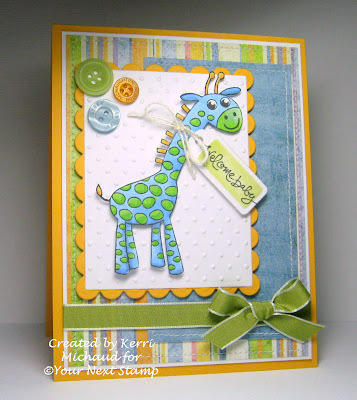 Giraffes definitely are for baby cards - LOL I think I have seen them a few times out in blogland on cards and always on a baby card. The colors here are so sweet and I always love it when you pop up to add dimension; the buttons are great baby addition too. AWWW Kerri what a sweet image girl, these colors are PERFECT for a baby card....LOVIN this paper!!! Have a great day sweetie! AWE! That stamp is adorable! Great layout. Love the buttons! Hugs! Awwww!! So cute Kerri! Perfect baby card, I love the swiss dots and little buttons :) SWEET!!! This is so fabulously ADORABLE! In love is what I am! Awww! I love the blue and green giraffe! It makes the perfect baby card! The tag around his neck is a great touch and the buttons too! Absolutely adorable...and I'm so with you! Giraffes = baby cards to me too! Super cute! Something about Giraffe's that yell cute babies hey! I totally associate giraffes with baby cards as well. And I love the colors you went with here. So fun and fresh. That ribbon is gorgeous!!! Want to come sew some cards together for me someday? LOL! A really cute card, the giraffe is so sweet, fab colours!! Love this card. Great job. So super cute! Love the colors - I never would have thought to make a blue and green giraffe, but it turned out perfect!! Also love all the 'bellies! Great job with the challenge!